Near the end of July , 1811, Simeon Perkins, a 75-year-old town official and diarist from Liverpool, Nova Scotia, laid the first stone of the foundation of the Coffin Island Lighthouse. This was the fifth lighthouse built in Nova Scotia. Under the hands of carpenter James Leslie from Shelburne, a wooden tower rose fifty eight feet from the stone foundation. The Nova Scotia House of Assembly granted 500 pounds to build the tower and a dwelling for the keeper and a year later contributed another 500 pounds for equipment, lantern and railing. While provincially funded, the light was locally planned and supervised by a four man commission from Liverpool. Liverpool in this period was the second most active port in Nova Scotia and enjoying a trade boom thanks to the Embargo Acts which channeled a large amount of US commerce through Nova Scotian ports. 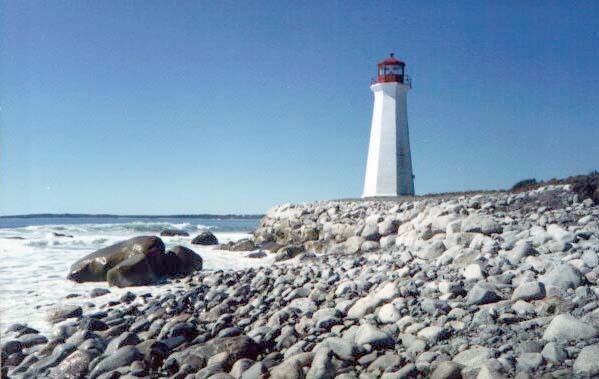 An impressive achievement for a growing community, the lighthouse was the only beacon between Sambro at Halifax, and Cape Roseway at Shelburne, which along with the light at Brier Island, made up all the lights in the province (aside from the ruins of the old French lighthouse at Louisbourg, Canada's first). The lighthouse stood on the south end of the mile-long island, itself only a mile from the nearest mainland village at Beach Meadows. At the north end of the island, a small seasonal fishing harbour stood, and still stands, connected to the light by a road cut through the woods. Known as Bear Island in Perkin's time, it became known as Coffin Island by the 1817s after Peleg Coffin, one of the founding settlers in Liverpool and a large landowner on the island. It is unclear who was the first keeper until James McLeod's name appears in a petition for unpaid wages in early 1817. Many keepers and their families followed, most from Queens County, and a large number, such as various members of the Wentzel family, were from Beach Meadows, the nearest village on the mainland. Keeper Thomas Eaton's life ended tragically on Oct. 7, 1871 when he drowned, while sailing into Liverpool for supplies. His wife kept the light for the rest of the year until she had to leave for the official replacement keeper. James McLeod: Coffin Island's First Recorded Lightkeeper A bold and talented man of many adventures was the first recorded keeper of the Coffin Island light. Born in Liverpool in 1772, McLeod was a carpenter and mariner who commanded fishing schooners and trading brigantines, using Coffin Island to dry and pack his fish. Not always successful in economic hard times McLeod had to briefly flee a harsh creditor in 1805. However he served his community as constable and militia sergeant and in wartime went privateering, aboard the large Liverpool privateer ships such as Duke of Kent and Charles Mary Wentworth. While McLeod was serving as prizemaster aboard the Wentworth in 1800, a British frigate HMS La Unity impressed (forcibly recruited) eight of Wentworth's crew, including McLeod. Impressment was often a death sentence thanks to the harsh conditions of battle, accident and disease aboard Royal Navy ships. McLeod soon made his escape, jumping overboard on the coast of Venezuela, apparently judging his chances on the enemy held coastline as better than the odds in the navy. According to Liverpool folklore the frigate's commander was so outraged by this act of defiance that he vowed to catch McLeod and "hang him lie a rabbit" for desertion, to which McLeod replied, "To make rabbit pie, you must catch the rabbit" as he successfully eluded the Royal Navy, eventually working his way back to Liverpool. Mcleaod was present during the building of the Coffin Island lighthouse, and Perkins noted his talent in cooking fish chowder, He was at some point appointed keeper of Coffin Island where he built up the rough trail to the light into a decent road. A man known for his ingenuity in creating tools and improvised medical devices, McLeod is credited by some Liverpool sources as designing the revolving light mechanism for the Coffin Island light, a very early appearance of this technology on the Canadian coasts. The first tower stood for over a century. It acquired four, red, horizontal "barber pole" stripes in 1841 and a replacement lantern in 1873. Worries about erosion from the sea led to the introduction of protective wooden cribwork in 1876 which had to be constantly rebuilt in the decades that followed. A different threat destroyed the original tower on June 19, 1913, when lightning ignited a massive fire that also destroyed the keeper's house. 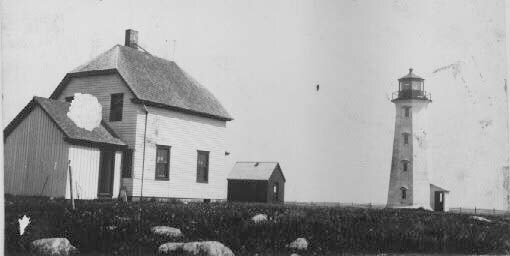 A temporary tower served until October 1914 when a new 54 foot white octagonal concrete tower was completed along with a square hip-roofed dwelling for the keeper. The keeper's house did not survive automation in 1962 but the tower still stands. 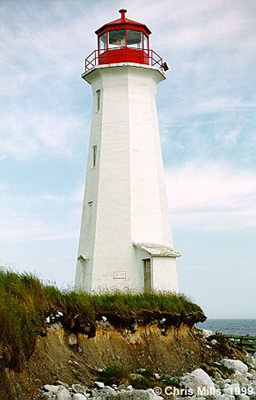 The lighthouse after armour rock was added on the shore in 1999. 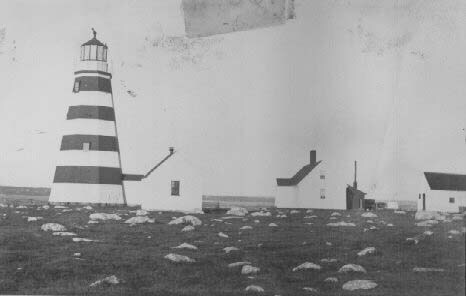 On June 26, 1811, Simeon Perkins, a 75-year-old town official and diarist from Liverpool, Nova Scotia, recorded a pleasant trip to inspect the lighthouse (Coffin Island Lighthouse) being built on the island at the entrance to Liverpool Bay: "they have dug for the foundation ... there is a kind of Moss & turf on the surface then about two feet deep comes to a hard pan ... which I think will be a good bottom to Build the Foundation upon - it is about 90 feet from the Sea Wall ... at present the distance is very well but there may be Some danger (as the wood is Cut away ) of the Sea wearing away the Land in time." Prophetic words! A hundred and eighty seven years later the successor to the lighthouse that Perkins helped found, standing on the fifth oldest lighthouse site in all of Nova Scotia, is on the edge of succumbing to the sea which has eroded up to it and around it. 1/8 of the base is undermined. The Canadian Coast Guard plans to replace the light with a buoy and has proposed demolishing the tower as a safety hazard. It is feared that the light will topple in a winter storm. The newly formed Coffin Island Lighthouse Heritage Society has won a one year reprieve on demolition to give time to find a way to save the tower and protect its site. Coffin Island is located on the South point of an island of the same name, Northeast of the entrance to the Mersey River and Liverpool Harbour . The nearest mainland viewing point is the beach at Beach Meadows, between Eagle Head and Brooklyn. 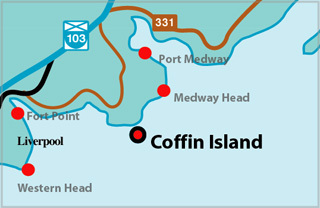 The work on Coffin Island is complete. 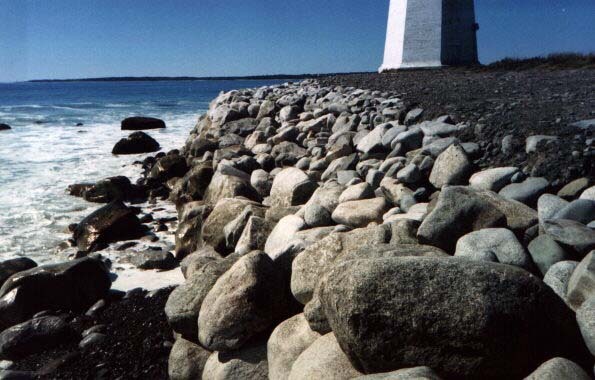 Large scale re-enforcement with armour rock and infill was installed around the lighthouse over the summer and the work went off without a hitch. The Coast Guard says it exceeds their standards. Based on similar work on Islands in Mahone Bay, the Coffin Island group feels Coffin Should be safe for many years. The power of the ocean in Liverpool Bay is tremendous, Storms moved the armour rock, and by 2006 the lighthouse was undermined once again . Storms also washed the buoy, which was set out to replace the lighthouse, ashore! So the Department of Fisheries and Oceans (DFO) had no choice but to retain a land-based beacon. Because of the work of the Coffin Island Society, and the fact that many people come to view the lighthouse from Beach Madows, DFO decided to replace the lightouse with a round, tapered fiberglass tower rather than a skeleton tower. Coffin Island Lighthouse may be viewed from the beach at Beach Meadows, between Eagle Head and Brooklyn. The boat club at Brooklyn sometimes does boat trips to the island. Light Height: 070ft feet above water level.